In 2016 Benjamin won 1st Prize at the Young Concert Artists auditions in New York and in 2017 3rd Prize at the Michael Hill Competition in New Zealand. Highlights over the last year include a critically acclaimed debut at Merkin Concert Hall in New York, recitals at the Kennedy Center in Washington D.C., the Festspiele Mecklenburg-Vorpommern in Germany and Three Palaces Festival in Malta. He toured throughout Canada, China, Argentina, Colombia and Chile and appeared as soloist with the Royal Philharmonic, BBC Concert, Sinfonia Cymru, National Children’s and the Antioquia Youth Symphony Orchestras. Equally at home as a chamber musician Benjamin took part in the Bridgehampton Chamber Music Festival with Anthony Marwood and Caramoor Rising Stars series in the USA, and returned to the East Neuk and Northern Chords Festivals. He has taken part in festivals across Europe including the Pärnu, Steirisches Kammermusik, Klosters and Cheltenham Festivals. In 2016 and 2017 he was a Fellow at the Steans Music Institute in Ravinia. Engagements during 2018/19 include a Wigmore Hall Coffee Concert and recitals at the National Concert Hall in Dublin and Music for Galway Festival. He returns to the USA, Colombia, Chile and New Zealand and makes his debut in Australia. Solo appearances in recent seasons include the Philharmonia, Auckland Philharmonia, English Chamber, Royal Northern Sinfonia, London Mozart Players, Orchestra Sinfonica Abruzzese L’Aquila and Maui Pops Orchestras. He premiered a new Concerto Stranded by Matthew Kaner for Europe Day at St. John’s Smith Square and collaborated as soloist with the Royal New Zealand Ballet Company. In 2015 he released his first CD for Champs Hill Records which immediately went to No.12 in the Classical Charts. 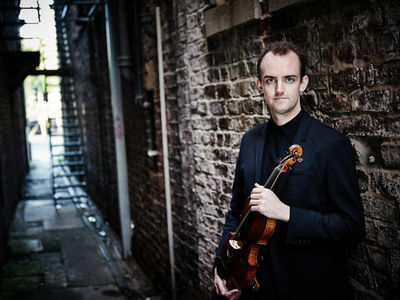 Born in New Zealand, Benjamin studied at the Yehudi Menuhin School and the Royal College of Music where he was awarded the Queen Elizabeth the Queen Mother Rose Bowl. In 2013 he won 1st Prize at the Windsor International Competition and was selected by Young Classical Artists Trust. Hugely popular in New Zealand Benjamin returns whenever he is able, to give concerts and appear on radio and television. He moved to the UK in 1998 with his family to study at the Yehudi Menuhin School, on the recommendation of Nigel Kennedy. He is very grateful to be awarded Honorary Membership of the Rotary Club of Port Nicholson for his commitment to children’s charities. Benjamin plays on a Tononi violin (1709) on generous loan from a private individual. He is grateful for support from the Wallace Foundation and The Carne Trust.